I’m going to take a look at the most valuable singles of the Commander 2014 decks to see if there is anything currently undervalued now that the set has been in stores for several months and has been widely distributed. Since there is plenty of information to cover, I’m going to split this into two posts. Part one will cover the white and blue decks. Part two will cover the black, red, and green decks. Let’s start with the white deck first, since it makes sense from both a color wheel perspective and because this deck contains the Legacy staple that Wizards decided to include amongst the decks of this type of product – Containment Priest. Containment Priest – Surprisingly, this card is at an all time low of $16 right now from its high of $24 back in November. You could have even paid potentially more than that if you needed her the weekend of Grand Prix New Jersey, which unfortunately happened within a week of the Commander 2014 release. My feeling here is that if True-Name Nemesis can’t even hold a $20 price tag than neither can Priest. Speaking of which, True-Name Nemesis seems like a great pick up right now since they are a recurring Legacy staple and have fallen steeply in price since their $50+ heydays. Containment Priest won’t follow the same pattern though, since she is a sideboard card in Legacy rather than a main deck threat like TNN. 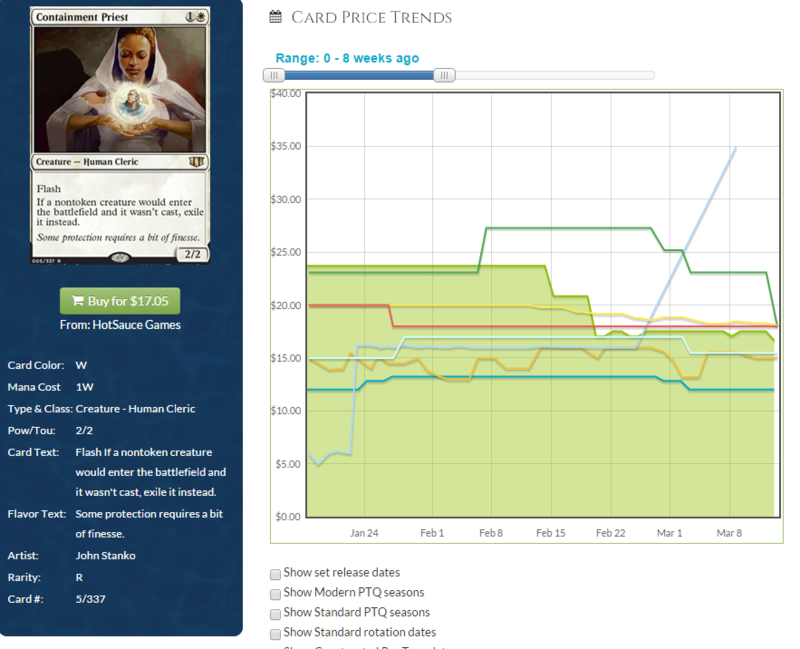 As more Commander 2014 is released, the price only stands to stagnate or even drop further. I would avoid Priest unless you need them for Legacy. Nahiri, the Lithomancer – I’ll say this right up front. I’m a fan of all the planeswalkers from this set because they have several qualities that I like in long term pickups. For all these reasons, plus the fact that they are all in the $5-$7 range, I believe that the planeswalkers from Commander 2014 are all solid pickups as singles. I have a feeling that Teferi and Daretti will become the most valuable in the long run however each planeswalker will grow in time from casual demand. Grand Abolisher – Grand Abolisher actually didn’t take that much of a nose dive in price compared to some of the other cards that were reprinted in Commander 2014. It went from $4 to $3, a drop of 25% but not that large in the grand scheme of things. I believe that the casual is strong with this card, and that eventually it will start climbing up again in price until the next reprint. Now is a great time to pick up Abolisher if you even wanted one as they won’t get much cheaper than this. Sol Ring – Sol Ring has finally been printed so many times that it is now around $3 per copy. I really don’t think Ring is a great place to put your money anymore. Wizards has proven that they’re going to print this card in every single Commander pre-con that they make, so players aren’t going to be looking for copies that often. Foils are another story, however I feel that regular Sol Rings are past their price prime due to being reprinted into oblivion. Masterwork of Ingenuity – Cute card, but its price drop to $2 indicates to me that players aren’t clamoring to get extra copies of Equipment to use for their own schemes in Commander games. I don’t think this has a home in Legacy because it is too narrow (and also because Stoneforge Mystic is so good) so future demand isn’t coming from there. Not the card you want to buy enmass for future gains. Angel of the Dire Hour – This card has potential to me, especially at $1.50 and lower. If you can pick these up for $1 or less then I think you will do quite well in the future. Angels are a popular casual tribe and this angel is awesome removal that leaves behind a big, flying body. I”ll be picking up extra copies of in trades and other deals. Pearl Medallion – The medallions are a great addition to any mono colored Commander deck, so even with the reprint they will continue to gain value over time. The Tempest copies haven’t been drastically affected by the mass C14 reprint, so even if you have the old school version you didn’t lose that much value (due to the new art and card look compared to the old version). I feel like each medallion has entered its low point going into the $1.50 and less range. I will be looking around for extra copies to trade into and buy for all the colors. Hallowed Spiritkeeper – Spiritkeeper’s future price is going to be hard to guess, as I feel that the price is very cheap at $1.30 and lower. Yet, I just don’t feel like this card will ever have a home in eternal formats like Legacy. Eternal formats are partially what drives the increase in the price of cards, other than casual demand, and I don’t really see much appeal to this card that would drive casual demand. I’m not going to be buying any, but I will keep my eye on this card going forward as the effect is strong and may possibly be desired in the future. The card provides nice wrath protection, at the very least. Next up in the color order is the mono blue Commander deck, which many view as the weakest deck in the lot. From what I hear, players aren’t really buying the deck in favor of the others due to the weird nature of this deck revolving around large sea creatures. Teferi, Temporal Archmage – Along with Freyalise, Teferi is the only other planeswalker in the set that is around $7 retail. From what I hear on the ground, players really want to pick up Teferi. I mean, that last ability is a casual players magical christmas land. Giving all your Planeswalkers instant speed activations for all loyalty abilities is one of the Johnniest things you can do. Think of all those triggers that will allow you to control the game, no matter whose turn it is! Think of all those tricky things you can do when responding at instant to speed to something with a planeswalkers ability! Think of all the ultimate abilities that will go off with so many counters being placed so quickly! So of course, Teferi is going into basically any deck (Commander or casual) that utilizes lots of planeswalkers for maximum value out of all the loyalty activations. Out of all the planeswalkers, I like Teferi the most due to his unique ultimate ability that allows you to have instant speed loyalty abilities. I believe that $7 is the floor for this ‘walker and that he will only be going up from here. Thran Dynamo – Despite having two other reprints in supplementary products, Thran Dynamo is still going strong at $5 and higher retail. Like Sol Ring, I don’t think Dynamo is where you want to be for future gains, however I can’t deny that this card has huge casual appeal from all the Timmy’s that want to play their eight drops on turn five. I won’t blame if you pick up a bunch of extra copies but just be wary that Wizards does reprint this card from time to time. Interestingly, they only reprinted it in Peer Through Time, which could be the factor keeping the price at $5 and higher. Reef Worm – A great casual card; I will be watching this for any future declines. If it goes below $2 I will be very interested in getting my hands on some copies. This is a card that screams casual to me, so I think it will always have fans in the future that want to abuse the effect. Yet, I think that this is a very slow gainer since you need to do some work to make the card great. Sapphire Medallion – See my Pearl Medallion review above. Sapphire is the highest priced medallion at $2.50 retail, and even though it is higher priced than the others my thinking still applies. I believe that Sapphire Medallion will be a long term gainer just like all the others. Cyclonic Rift – One of the most powerful sweepers that blue has received for Commander, Rift will always maintain value due to its power in the format. Though it currently sits at $2, there will be room to grow for this card until the next reprint. I even like foils of this card at $10, as it is a staple in pretty much every blue Commander deck. 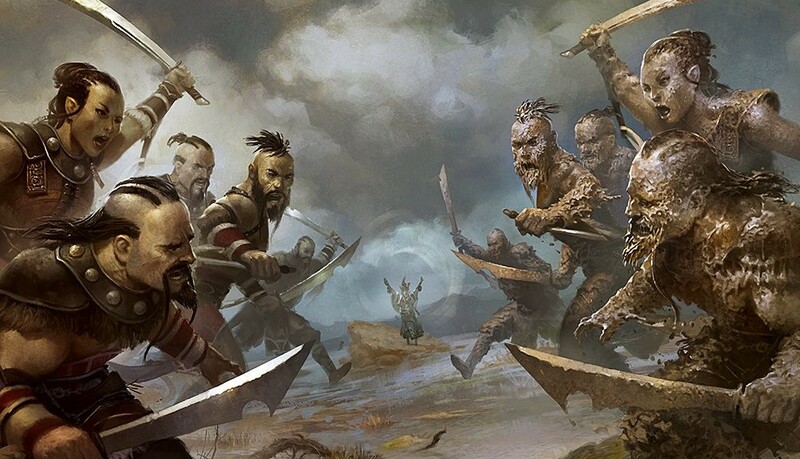 Rite of Replication – Like Rift, this is a super power spell that will most of the time win the player the game if it is cast at the right time. My same thinking applies for Rite as it did for Rift, even for foils which are around $11 retail. Actually, that seems pretty cheap for foils from Zendikar compared to Return to Ravnica. Zendikar has been out of print for a while, so I’m surprised the foil price of Rite of Replication isn’t higher. Nevinyrral’s Disk – Since this card has received so many reprints, I don’t think we’ll ever see it go above $2 again. I would stay far away from Disk from a financial perspective. It got hit hard by the double Commander reprint, and even if it does start climbing again I feel that this will continue to be reprinted in products like Commander. I plan on tackling the commons and uncommons of Fate Reforged for my next article, since the full set of Dragons of Tarkir has been spoiled. However, don’t fret dear reader! I will continue to work on this two-part series to make sure that I’ve identified the cards from all the Commander 2014 decks that I’d like to talk about. I totally agree on your planeswalker specs. However, I recommend bumping Freyalise up your list- she’s definitely the most powerful and easy to build around of all the other planeswalker commanders and she’s won many games at our tables. She’s got no bad matchup (degenerate recurring enchantments/artifacts are no match for her -2) and she’s the second oldest planeswalker of all time (older than Karn but shy of Nicol Bolas). She’s a keeper and I’d date her.